i just went through the top 100 SF foods again with my roommate last night to narrow down what we’re aiming to hit up before i bounce for the east coast. while i’m on the list tip, bear with me as i indulge my desire to see how well i’m doing on 100 Chinese Foods To Try Before You Die from a beautiful and serious food-porntastic website called appetite for china. the author is a freelance writer and cooking instructor with french culinary training who learned about food in her parent’s chinese restaurants and now travels, writes, and teaches around world. i’m inspired, admiring, and envious. it’s a gorgeous site and full of good recipes that i plan to try asap. i’ve included a few of her accompanying photos. is it weird that i want to jump into this bowl of congee (what i grew up calling shi fan or jook) and float on top in a rice-flavored steam bath? she says that the list is a pretty broad definition of chinese food and a mostly modern take, which makes sense for me as a second and third generation chinese-american who grew up eating chinese food, american food, and american chinese food. posts with links take you back to recipes on her site or wikipedia definitions, so i’ve bolded the ones i’ve tried and added a few comments. Asian pear – that seems unfairly easy. Baijiu – an everpresent alcoholic offering in china. Beef brisket – my mom makes this and it’s DOPE. Cantonese roast duck – mmm…my whole family loves roast duck. 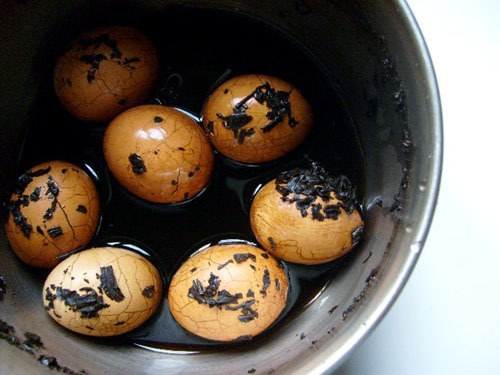 Century egg, or thousand-year egg – in my opinion, it is a texturally bizarre and marginally gag-reflex-inducing experience to unexpectedly encounter one of these in your porridge. definitely a classic jook ingredient though. Cha siu (Cantonese roast pork) – one of the most delicious salty-sweet-meat combos in a bun. i remember eating these in NYC chinatown with my grandmother. Congee – also known as shi fan, jook, porridge and probably a bunch of other names. eating jook always reminds me of family holidays like thanksgiving at my aunt and uncle’s house in albany. once the meal is done and the meat has been picked off the carcass, the turkey skeleton gets tossed into a pot of rice and 5-10 times as much water. the next morning we’d wake up to steaming thick savory rice porridge with bits of meat and scallions. such a perfect winter family meal, and it takes practically no work. Crab rangoon – so classic americanized greasy hole in the wall late night chinese food steez. Dragon’s Beard candy – just had this recently! tastes like if you ate your grandma’s sweater and it turned out to be subtly sweet and vaguely delicious. Egg tart, Cantonese or Macanese – my cousin paul always says that while asian food is absolutely amazing, the continent is a bit behind when it comes to desserts. as a kid, i always thought that these egg tarts were kind of a poor dessert substitute, but had them recently in nyc and, i’ll be honest, i ate five in one sitting. Fortune cookies – these have a fascinating history and may not even be chinese in origin, but possibly japanese or american. Jellyfish – i have a very strong memory of eating this and duck tongues in an LA-area chinese banquet restaurant with my uncle michael’s family. i think if you could eat sesame-flavored cold translucent gelatinous plastic, it would taste like jellyfish. Kosher Chinese food – this is such a classic Brookline feature (my hometown) that i’m surprised i’ve never tried it. Lomo Saltado -interesting, this is something i associate with south america cause that’s where i’ve eaten it. turns out it is chinese-peruvian fusion. Lychee – so fun to peel! Macaroni in soup with Spam – although i’ve never had this exact dish, spam reminds me of visiting my uncle victor’s family in hawaii for the first time when i was six. Mantou, especially if fried and dipped in sweetened condensed milk – i will forever associate mantou with a skit from a chinese camp i went to in minnesota at age 14. someone sang ‘mantou man’ to the tune of the village people’s macho man and i will never lose that association with the word mantou. (btw, please click that link if you want a thoroughly enjoyable muscle-pumping dude in a tank top 70’s music video). Nor mai gai (chicken and sticky rice in lotus leaf) – LOOOOOOVE THIS DISH. Pan-fried jiaozi – i heart everything dumpling. Peking duck – this is one of my favorite dishes ever, and i think my favorite memory of eating it is going to peking duck house restaurant in nyc chinatown with my grandmother. so fatty, so succulent, so juicy yet crispy, so perfect. Roujiamo – her accompanying photo of this makes me want to make this RIGHT NOW and put it in my mouth. Scallion pancake – i have wonderful memories of making this on my kitchen table at home as a kid. you roll out a long snake of scallion-studded dough, then curl it into a spiral, then FLATTEN. fry in oil, savor, stuff yourself silly. Turnip cake (law bok gau) – my dad and aunt tina love this stuff. i’ve just come around to it recently. i don’t know why i didn’t like it, because almost everything pan-fried is delicious, but i think it was because i always expected it to taste like potato and then would have the unexpected stronger flavor of turnip. but now i’m way into this, and it’s super tasty from super 88 in boston. Xiaolongbao (soup dumplings) – i realize i’m quick to throw out the word ‘favorite’ when discussing many food items, but i can’t keep from getting excited when it comes to dumplings. and choosing between fried dumplings and soup dumplings is like choosing between breathing and sleeping. or kittens and puppies. or twilight and harry potter. or battling an ever-regenerating mustache and always reeking horrifically of B.O. so much love for all these things that the bestowal of multi-favoritism must be understood and accepted. thanks diana! i hope it’s cool that i’ve so shamelessly poached from your blog post, it’s done with an immense amount of respect and admiration. i think i’m at 75/100 (clearly i’m not very good at counting in high double digits). most of the ones i haven’t tried are dishes i haven’t seen before, with a few exceptions for items i thought were gross when i was younger. now i’ll put anything in my mouth at least once (zing!). kidding kidding, i’m trying to keep this PG because i’m going to send this out to my entire family and this is already making me feel reeeally awkward. i really enjoyed all the family food memories that came up as i went through the list and want to share them with my relatives. this is part of why irene and i started this blog and why i named it family styles – food and eating carry such strong shared memories and cultural values and family bonds and passionate enjoyment and eating family-style embodies so many of those principles. my strongest memories of many of my relatives involve taking over huge chinese restaurants (i have a LOT of cousins, and they’re all awesome) with their big round tables and spinning lazy susans and tackling an immense number of dishes, always family style.